Global UAV Technologies (CSE:UAV) is one of the few listed operators in the fast-growing field of unmanned aerial vehicles (UAVs). Formed just more than a year ago, Global UAV has quickly merged complementary businesses, allowing it to be a “one-stop shop” for those requiring UAV – or “drone”, if you prefer – services and for those who want to offer their own drone services. The group has been assembled quickly through acquisition. The focus has been on buying companies with proven technologies that provide cash flow. As a result, unlike many nascent technology companies, it is already earning revenues, including a modest profit in the third quarter of 2017. Admittedly, those revenue and profit numbers are small at the moment, as might be expected of a company capitalised at less than C$20mln. With revenues rising rapidly and a high-margin business model, however, there is every reason to believe the stock is readying for take-off. One of the group’s subsidiaries, Pioneer Aerial Surveys, is the industry leader in drone geophysics and field operations. In simple English, the company’s drone service can provide information on the physical properties of a land area. This service is a more cost-effective operation than manned surveys and can reach places a manned aircraft or ground crews would find hard to access. Pioneer Aerial’s UAV-MAG surveys are in high demand from mineral exploration and mining companies worldwide. In a similar vein, Global UAV’s other services subsidiary, High-Eye Aerial Imaging, provides low altitude, high definition, LiDAR (light detection and ranging), aerial surveying, photography, videography and other aerial mapping services. Again, mining companies are keen on this stuff, but so too are the construction, engineering and agriculture industries, to name a few. The company uses its own drones, designed and manufactured by its NOVAerial Robotics division. Its flagship Procyon 800E helicopter is used by international customers and is considered one of the best UAVs in its class. The single-rotor helicopter style design of the Procyon provides higher payload capacities and longer flight times than a typical commercial-grade multi-rotor UAV. The company also has a division, UAV Regulatory Services, which provides an online service called Easy SFOC. This service assists clients with the preparation of special flight operation certificates (SFOCs). These certificates are required for the operation of recreational and commercial drones in Canada. “It can be a fairly complex process to apply for that [an SFOC], so UAV Regulatory essentially offers a consultancy service to consumers who are interested in starting their own business. We can guide them through the regulatory requirements to help them get their licenses,” explained Michael Burns, CEO of Global UAV. Together, these four businesses within Global UAV provide a fully integrated profile of manufacturing, services and regulatory compliance unique to the UAV industry and its customers. “Right now, the main revenue-producing component of Global UAV is our services division, consisting mainly of photogrammetry and geophysical surveying,” Burns explained. “The geophysical surveying services have been very lucrative for us. We have been the leader in this commercially since 2014 when we really brought this technology to market. We set ourselves up as a commercial supplier of the UAV-MAG services through Pioneer Aerial,” Burns continued. 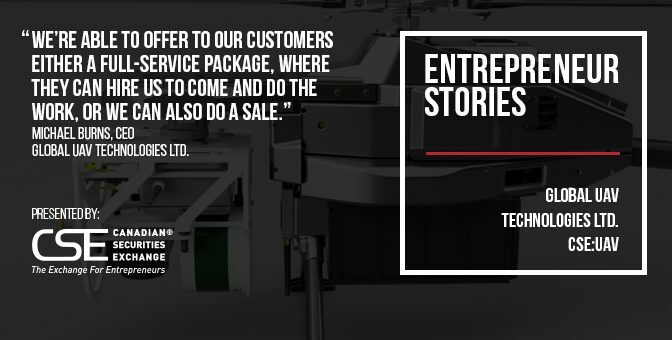 “We’re able to offer to our customers either a full-service package, where they can hire us to come and do the work, or we can also do a sale. If a customer would like to purchase the equipment and get set up as a user, we can sell them a drone, train the customer and set them up with all the regulatory framework.” Burns added that it is a very attractive model for small companies. A chart of quarter-by-quarter sales for Global UAV shows the sort of vertical take-off one might expect from the company’s drones. In the first quarter (the three months to January 31), sales were C$22,386; in the second quarter they soared to C$181,204, and in the third, they rose to C$333,529. The third quarter – to the end of July – saw the company move into the black, with net income of C$154,956. A NOVAerial drone typically sells for US$30,000 to US$40,000. Therefore, the company does not exactly need the manufacturing clout of General Motors to keep that top line moving north at a rate of knots, especially as a high-margin business that gets the bottom line heading in the right direction as well. According to auditing and consulting services provider PwC, “the drone revolution is disrupting industries ranging from agriculture to film-making”. PwC values the emerging global market for business services at US$127bn, with infrastructure (US$45.2bn) and agriculture (US$32.4bn) the two biggest markets, while mining, where Global UAV is already strong, is valued at US$4.3bn. In conclusion, the market opportunity is enormous. As James Rogers observed, however, North America is not awash with listed pure-play UAV companies, with big names such as Facebook, Google, Amazon and Boeing certainly having their fingers in the pie. 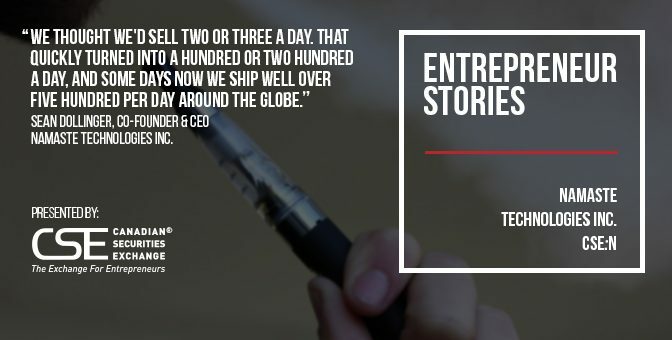 This story was originally published at www.proactiveinvestors.com on March 2, 2018 and featured in The Public Entrepreneur. Learn more about Global UAV Technologies at https://www.globaluavtech.com/ and on the CSE website at http://thecse.com/en/listings/technology/global-uav-technologies-ltd.
Exro Technologies Inc (CSE:XRO) has developed a technology to enhance an invention that has served mankind remarkably for more than 150 years. Exro’s dynamic power management technology enables electric generators and motors to work at peak efficiency, even at variable speeds. For scores of years this has not been a problem because generators have used an energy source – coal, diesel, or gas – that allows the rotating part of the generator to remain at, and operate at, a consistent and optimum speed and torque, but the increasing push towards renewable energy is changing the game. Mother Nature may be bountiful, but she is not constant, and if you don’t believe it, think of those seemingly paradoxical reports of wind turbine generators shutting down because it is too windy. “What we do at Exro is, very simply, bring Intelligence to a generator and an electric motor,” Godsy says. So, what’s the big twist on the ancient technology? The traditional generator works off a single configuration of coiled copper wires, whereas Exro’s does not. “We isolate all of the coils. We then create circuits amongst them, driven by a computer that, depending on the speed and torque, will reconfigure the coils in the generator for exactly the right speed and torque, creating an efficient and “Intelligent” generator,” Godsy explains. The technology was invented by Jonathan Ritchey, Exro’s founder and its chief scientist and designer. Optimizing power systems is becoming more important in the current economy. “The problem does not apply only for renewables,” Ritchey declares. Take electric motors. These are essentially the flip-side of electric generators, and the same conundrum applies: getting the motor to work at maximum efficiency at variable rotational speeds. “These are the technical issues that Exro is addressing,” Ritchey asserts. Ritchey sees a lot of applications for Exro’s technology in the high-profile sector of electric and electric-hybrid vehicles. “Put in our technology and it will allow you to have a situation where we not only gather more electricity when you are braking but that electricity does more for you when you are converting it back into mechanical energy,” Ritchey says. The potential breadth of applications for the technology is enormous, but initially, Exro is targeting proof of concept in wind energy, unmanned aerial vehicles (drones) and electric/hybrid vehicles starting with electric bicycles. The company has built three prototypes to prove its technology’s viability and is now focusing on early market opportunities. In a capital-intensive, low-margin business, those sorts of efficiency improvements are sure to make wind farm operators sit up and take notice. Exro’s technology can also be used to retrofit existing wind turbines. As for drones, these will become more efficient, paving the way for smaller drones or bigger payloads, and potentially longer flying times. Exro has already signed a development agreement with a leading supplier of propulsion systems for drones and is working towards validating the technology for this application. As for electric/hybrid vehicles, reduced electricity consumption and greater power regeneration when braking could significantly reduce the range anxiety for drivers. The name of the game for Exro is to prioritize near-term market opportunities with low execution risk. A key aspect of this strategy calls for securing partnerships with leading companies who have their own design and manufacturing facilities and distribution channels. Exro’s revenues will largely come from licensing fees and ongoing royalties, in return for allowing the use of its technology to be integrated into generators or electric motors. “The reason for a licensing/royalty model is to achieve scale and create concurrent value for our shareholders. Our proprietary technology has the potential of creating intelligence in billions of electric rotating machines — be it in generators or electric motors. If we were to do an elevator a day just for the approximate 17 Western European countries, it would take us over 1,000 years,” Godsy explains. “We need to work synergistically with parties in this space by working with them, not competing against them. “We want to work with all companies that can benefit from our technology – not unlike Intel wants to provide processors to all computers versus creating its own computer brand and competing with them – working with companies is a much better long-term strategy since our technology is easily integrated into generators and motors,” he adds. If that sounds like the semi-fabled “win-win” scenario, there’s actually a third “win” to be taken into consideration and that’s the environmental aspect. It was one of the things that drew serial entrepreneur Godsy to Exro in the first place. “I was attracted to Exro as I am concerned as much now about the health of our planet as I am about the health of people. 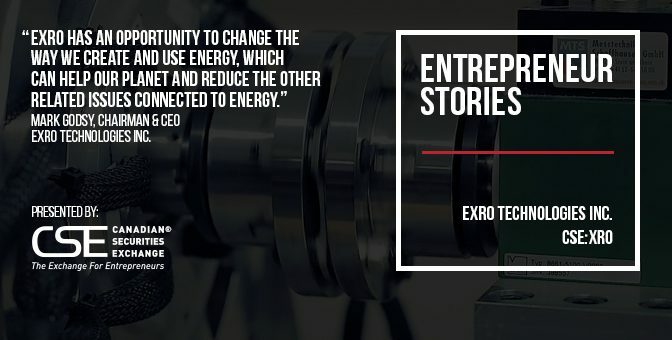 Exro has an opportunity to change the way we create and use energy, which can help our planet and reduce the other related issues connected to energy. The win-win here also includes the opportunity to build value for our shareholders,” Godsy says. Company founder Ritchey believes the drive to a clean power world will eventually come down to economics. In other words, the bottom line will be the bottom line or, if you prefer, it will happen because “torque is cheap”. This story was originally published at www.proactiveinvestors.com on December 11, 2017 and featured in The CSE Quarterly. Learn more about Exro Technologies Inc. at http://www.exro.com/ and on the CSE website at http://thecse.com/en/listings/technology/exro-technologies-inc.